"The Chelsea branch of the Jam Tree family, located on Kings Road. 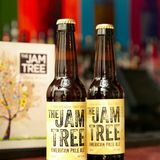 With an open plan and a fantastic garden, The Jam Tree is a great venue for after work drinks, Sunday lunch, and with our late licence, the perfect place on Friday and Saturday nights." Terrible service and very average food even for a gastro pub... lovely beer garden but I have to confess that's the most I can say, much better pubs and eating experiences to be had in the area. There is no better place than the Jam Tree when the sun is out!! We were there on one of the few decent days for weather so far this year and sat in the sun trap of a garden. The massive BBQ is fantastic and with the decor it feels like you could be on holiday!! The food was stunning, I had the chilli dog and the cocktails are to die for!! I had a peanut butter one which was amazing!! If the sun decides to come out again this summer I will make sure I come back! I must say I am surprised at the good reviews this place gets. Ive have been to the jam tree a few times now and each time a disappointment! the food is either late or cold, tables dirty or floor extremely slippery. The service although is really good, the girls are attentive, and see that you have everything you need. The last visit to the Jam tree was last saturday a week ago (27th) the girls were decorating the place, you could tell one of them was a bit too excited, but it was a nice atmosphere, until our food came. It was cold and didnt look too appealing. Last time i will be visiting! The best Sunday roast in London, by a country mile. 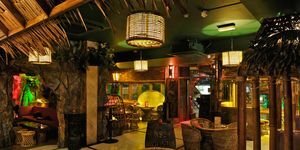 Great staff, great cocktails, perfect atmosphere. Child friendly, dog friendly, all round people friendly! I f***ing love this place! I love the food and the design is different. Has a real buzzy atmosphere, with good looking people with a mix of posh Chelsea-like people and not so posh Fulhamites, but it kinda works really well. Absolutely LOVE the Jam Tree. 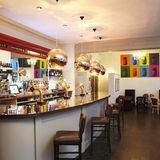 Lovely pub in Chelsea, light and airy decor, great food, great service and huge beer garden. I have been here a few times now (in fact, I’m becoming something of a regular!) and not once have I been disappointed. I would defiantly recommend this place! Went for a Thursday night dinner and cocktails with three girlfriends. The decor is lovely, just the right mix of quirk and style to make you feel at ease. Service was friendly, attentive and really couldn't be faulted. Food was just delicious! Had the scallops and prawns, which was truly one of the best meals I've had in a long time and I eat out at least twice a week. Thoroughly recommend this place. Finally! A taste of real urban chic on the King’s Road. If you’re tired of the Chelsea cheese then Jam Tree could be the answer. Past all of the luxury bed and chandelier shops, at the end of the pure OTT indulgence that is the modern day King’s Road, is Jam Tree – the antithesis of the pomp that fills the area. This is a laid back spot with an edgy feel that’s pitched just right for the Chelsea postcode. 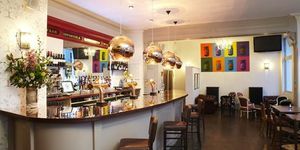 The small space centres around a long bar, exposed brickwork, a funky little birdcage, large metal light fittings, and Warhol-style artwork on the wall which were such a cool embellishment to the original Jam Tree in West Ken. However, this is Chelsea, not Shoreditch, and so the chandeliers, simple tree-print wallpaper, fireplace and neutral colourscheme add an upmarket edge that the locals will appreciate. It’s a clever mix. The real icing on the cake is the large beer garden out the back, which is nicely put together and sure to be very popular in the summer months. This is Chelsea so expect well-to-do, attractive punters in their twenties-to-thirties looking to splash the cash. However, with events such as the launch party that saw Norman Jay take to the decks, there’s a cool edge to the atmosphere here, which is so often missing in similar bars up and down this road. The DJ box is nestled at the far end of the room and as the evening wears on, the mood turns the pub into an impromptu dance floor. 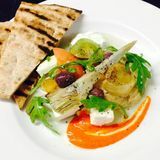 The food is a good twist on the usual gastropub fare, with some interesting options alongside more traditional dinnertime favourites. For example, a starter of Sotong Manis (£7.50) arrives as a generous portion of perfectly cooked sticky squid in a light batter covered in a flavoursome, well-balanced chilli, garlic and spring onion dipping sauce. This is mixed with main courses like the new season lamb rump (£14.50), cooked to specification but best ordered pink to make the most of the succulent, juicy meat and sweet, tender flavour. Served with Jersey Royals, peas and a delightfully subtle mint jus it’s a good example of the skills that the kitchen employ. Alternatively, the cod and prawn fishcakes (£10.50) are light and perfectly cooked with a pleasant floury texture and deep fish flavour. Served with spring greens, a runny poached egg and a perfectly seasoned parsley sauce, it’s excellent value for the price. Finally, the selection of British cheese is a winner for dessert, but if it’s a sweet treat you crave then the treacle tart (£6.50) is happily sickly sweet, served with a pot of cream and a white chocolate ice cream that surprisingly cuts through the sweetness well for a nicely balanced dish. For a bar of its type, it’s good that Jam Tree has made an effort to include some decent lagers on draught. However, it’s the wine list that really impresses. The lengthy choice offers good value for money with prices starting at just £16. And the menu is very descriptive, making choosing a bottle all the easier. 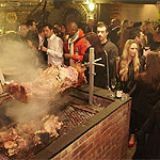 A stand-out choice is the Julio Bouchon Merlot 2008 from Chile (£23) with a tropical fruit finish and depth that works particularly well with meat dishes like the lamb. Jam Tree is a pleasant change of pace for the King’s Road and, if the locals can embrace the East London styling, it is sure be a big success. Being a huge fan of The Jam Tree, Kensington, my partner and I wanted to check out the latest Chelsea addition for lunch on Friday and were not disappointed. I went for the Seared Scallops with Pea and Potato Croquettes which were beautifully cooked and presented. My partner opted for the Vegetarian Rendeng Curry served with Nasi Goreng and having grown up in Indonesia assures me it was wonderfully authentic. So as always the food was second to none, as was the service, the staff always being incredibly accommodating but this latest Jam Tree also benefits from a fantastic and large decked garden with a separate bar. I can foresee many sunny afternoons spent here this summer. My only complaint would be that I want a Jam Tree south of the river closer to me!! I've lived in the area for almost 6 years now, and have seen The Jam Tree change hands several times over the years. This, I must say, is the best so far. 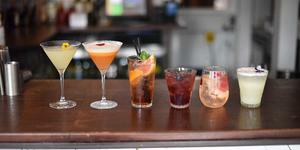 The owners have transformed an ugly Chelsea boozer into a lovely bar come restaurant. The Sunday roast was amazing! Looking forward to the summer when the beer garden will become my back yard! Good luck Jam Tree!